There are many different neighborhoods within Hua Hin and its surrounding areas. Each neighborhood caters to different lifestyles and has a different feel from the next neighborhood. Pranburi has a laid back, bohemian vibe with many luxury resorts, high-end restaurants and great coffee shops. Khao Kalok and Pak Naam Pran are located within Pranburi, and many people are now choosing to live here because it’s cleaner than Hua Hin, and you can buy an affordable home closer to the beach. There are also lots of outdoor activities nearby, such as mountain biking, hiking, caving, water sports (the international kite surfing championship is held here annually) and the nearby national park. Home prices (and especially land prices) in Pranburi are often cheaper than Hua Hin. For the same price, you can purchase a house nearly double the size in Pranburi compared with Hua Hin. Or vice versa: you can purchase a similar home in Pranburi for nearly half the price it would cost in Hua Hin. Central Hua Hin offers shopping malls (Bluport and Market Village), easy access to nightlife, the Hua Hin Beach, many restaurants, resorts, bars, and many other activities. However, this area tends to be more crowded and can be noisy. Additionally, land and housing prices in Central Hua Hin are quite a bit more expensive than the surrounding areas. Hence the number of new developments that are being constructed outside of Hua Hin city center. North Hua Hin caters to those who want to be in or near Palm Hills golf course, but it also offers other amenities, such as Makro, the airport, Index Living Mall, and a variety of restaurants. Living in North Hua Hin is also convenient for frequent trips to and from Bangkok, and it can shave nearly 30 minutes off the travel time to not have to drive through downtown Hua Hin. West Hua Hin encompasses a very wide girth and covers the geography from the south to north of Hua Hin town center all the way to the bypass road. There are many amenities in this area, especially golf courses (Banyan, Black Mountain, Majestic, Lakeside are a few options). Pala-U Road is the main thoroughfare, and it has many cafés, restaurants, various shops, and the beloved Artists Village and Elephant Sanctuary. 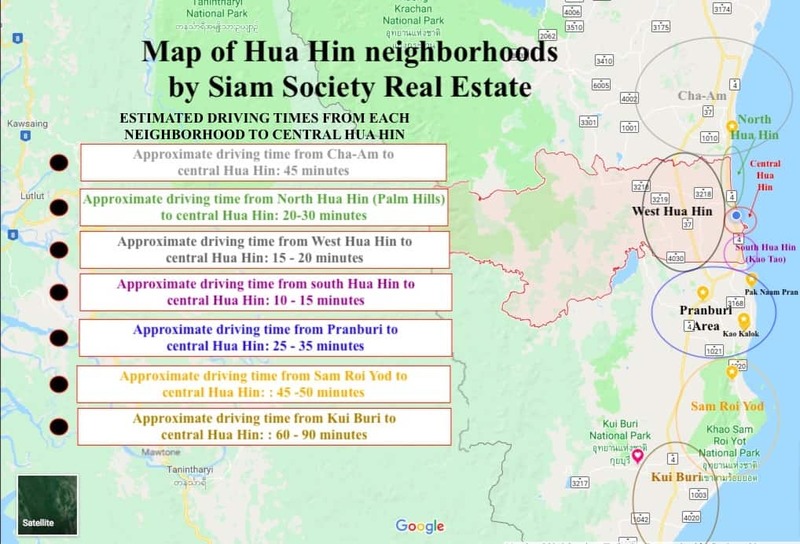 West Hua Hin is one of the most prolific residential areas, primarily because the land prices are relatively much more affordable than in Central Hua Hin. South Hua Hin (Khao Tao area) is about 7-10km south of Hua Hin town center. It is a happy medium between Pranburi and Central Hua Hin. South Hua Hin/Khao Tao has some great cafés to choose from, nice restaurants, and a beautiful beach. The location is quieter than central Hua Hin, but close enough to easily access when you feel like going out on the town. Sam Roi Yod (Dolphin Bay Area) is just south of the Pranburi/Khao Kalok area and offers beautiful nature, a quiet atmosphere, and options to be really close to the beach. Dolphin Bay is next door to the Sam Roi Yod National Park, and this area is known for great cycling and water sports, and generally attracts people looking for an active, outdoor lifestyle. Kui Buri is south of Pranburi by about 30 minutes. It’s a developing area, but still quite rural at the moment. Kui Buri town is nice and more authentically Thai with fewer expats currently living here. Home prices are often cheaper than Hua Hin, and it’s still possible to purchase absolute beachfront land in this area for a much more affordable price than anywhere else in the greater Hua Hin areas.